Oh, hi! My name is Lindsey and 2016 has turned me in absolute Hamilton trash. I’ve been drooling over this gorgeous book for months now. 2016 is the year I fell in love with Marissa Meyer and her Lunar Chronicles. So of course I am so eager to get my hands on this Queen of Hearts retelling. Also, I heard there would be lots of pastries in this. I may be the only person left on planet earth who has not yet read this majorly hyped book (or it’s sequel Gemina). I PROMISE I WILL FIX THIS TERRIBLE MISTAKE SOON, OKAY? I was highly anticipating this 2016 release. And then it came out and I… still haven’t read it. And it contains revenge plots, fantasy and morally grey characters! Clearly this cannot be. Hence the hope that I’ll find it under my tree and be able to dive right in! 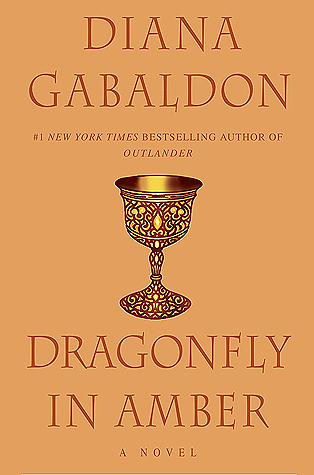 I finally read Outlander this year and now I am eager to continue the story with Dragonfly in Amber. I would love to check in again with Claire and Jamie and see how their story continues. This adult fantasy series has been intimidating me for way too long now. It has been hyped and praised by so many people and I am so looking forward to finally reading it and seeing it for myself. Are any of these books on your Santa wishlist as well? What other books would you love to find under your tree? Hamilton would be awesome, and I hope you like Illuminae when you get to it. It is pretty good. Ruined looks really cool too! Great list! We share Illuminae on our lists this week! I haven’t read it either, but I am determined to read it soon after loving Nevernight. 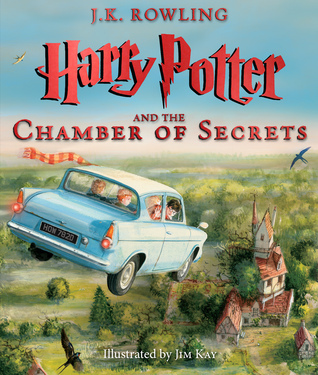 I do have a copy of the illustrated Harry Potter, but I’ve not had a chance to flick through it yet. Hopefully I can find some time during the Christmas break from work. I can’t wait to read Illuminae. I’m really hoping that it’s under my tree this Christmas! I hope you have a very happy holiday! I’m super excited for Illuminae too so here’s hoping we both find it under our tree this year 😉 Happy Holidays! I just ordered Heartless for myself! I’m excited to read it! I hope you get to continue the Outlander series soon. I love those books so much. I need to get caught up on them too. I still need to read A Breath of Snow and Ashes. I hope Santa brings you lots of books! Have a happy holiday! Great, I hope you’ll enjoy Heartless! I also hope to continue with the Outlander series, both books and tv show 🙂 Thanks and happy Holidays! I thought I was the last person reading Illuminae. I am only 100 pages in but it is fun with the format. 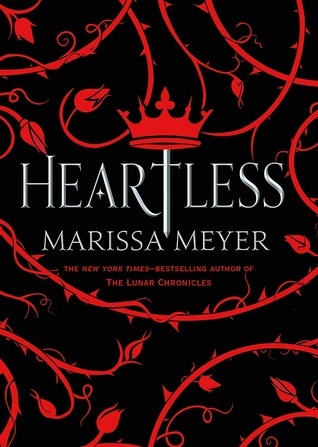 I am waiting to get Heartless on audio since I loved the Lunar Chronicles so much on audio and it is the same narrator. Outlander is one I need to read this year but so long!!! Hope you get all of these and more!! 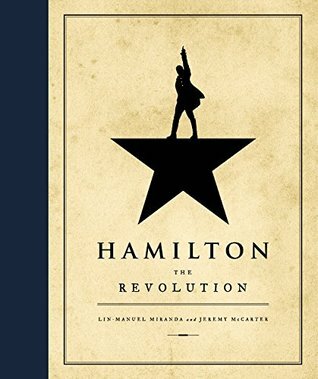 Omg I NEED Hamilton: The Revolution in my life! 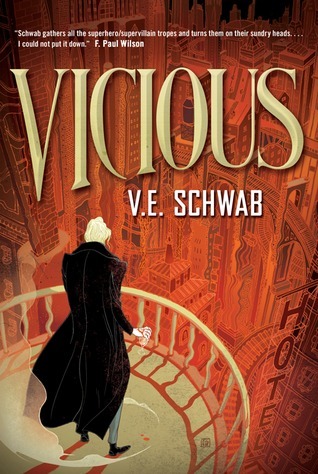 It’s so expensive, though :/ Anyway, you should totally read Vicious, because it’s really great and I’m sure you’ll love it! You REALLY should read Illuminae and Gemina, they are fantastic !!! Liz @ Freyja Eats Books recently posted…Top Ten Tuesday. 20.12.16. I heard so many good things about Illuminae and Gemina, I’m really hoping to read it soon! I am on hold for Illuminae at the library I borrow e-books from. I cannot wait to read it. Several of the others peak my interest too, including Vicious, Air Awakens, and Ruined. Those all sound really good. I’m excited to see what Santa brings too. Enjoy your reading and the holidays!! Oh, I’ll hope you’ll get to read Illuminae soon then and that you’ll enjoy it! Hopefully you’ll find a few interesting books under your tree this year as well 🙂 Happy Holidays! SO many good books on your list (personally I’m rooting for Santa to bring you The Name of the Wind… but I could use a physical copy too, I have them on audio). Hope they all find their way under your tree! 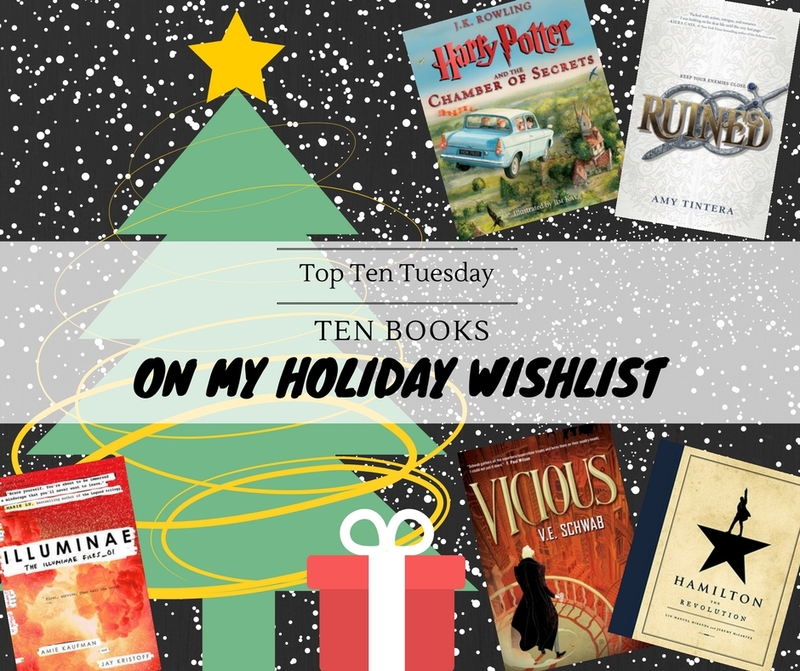 Kate @ Midnight Book Girl recently posted…Top Ten Tuesdays: Santa Baby! Marie @ Drizzle & Hurricane Books recently posted…Back to Stars Hollow! Thanks! 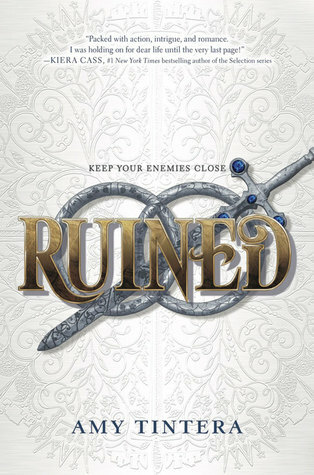 I’m keeping my fingers crossed to receive one or more of these 🙂 Hope you’ll also enjoy Ruined when you get to it! Nice list! It would be so great to get some of the new Harry Potter editions out there. I own older paperback copies, so I can’t really justify buying new copies for myself, but if someone else wanted to gift me with the illustrated versions or ones with updated covers, I wouldn’t say no! Here’s hoping we both get “Heartless” read asap in the new year. 🙂 Oh, and I had “Ruined” picked up last time I was in B&N, but wasn’t sure what it was about, so I didn’t get it. Now I’ll have to look into it! Oh yes, Heartless is definitely a must read 🙂 Ruined sounds so good, I hope it’ll live up to my expectations. 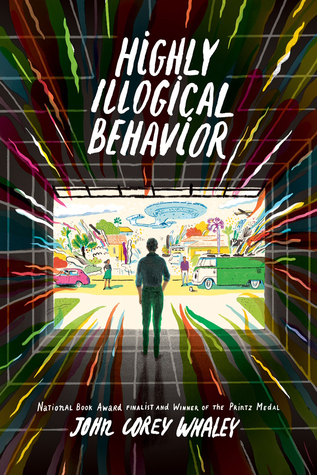 I really need Highly Illogical Behavior as well….and the 2nd Illustrated HP book. I just recently read the first one and it’s SO AWESOME! I’ve read Illiuminae and Gemina, but I really want a finished copy of Gemina to own. Here’s hoping we’ll both find them under our tree this year 🙂 I got the first HP illustrated book as a birthday gift so now of course I’m addicted and need the second one as well 🙂 Illuminae and Gemina are such highly praised books, I hope to get to them soon. Oh, hi fellow Hamilton trash! 🙂 I definitely don’t mind either, I’m so happy I gave the soundtrack a chance this year! Vicious is awesome!! Hopefully Santa is good to you this year! AHHH YOU HAVE SO MANY GOOD BOOKS ON YOUR LIST!! I adored In the Name of the Wind (even if it is a bit slow compared to lots of other fantasy series.). 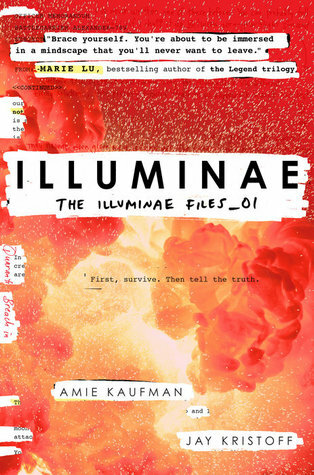 AND ILLUMINAE!!!!!!!!!!!!!!!!!!!!!!!! *please excuse my massive obsession with explanation points after that title! 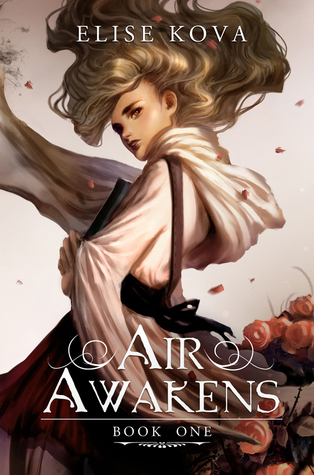 lol* I’ve not read Air Awakens either, but OMG the covers for that series look SO INSANELY PRETTY. I have no idea what the books are about either, but magic + pretty cover = NECESSARY FOR LIFE. Lol. There are sooooo many amazing books on this list! I definitely want to check out Air Awakens! Great list! I had the same thoughts when it came to V.E. Schwab. Vicious is really awesome! 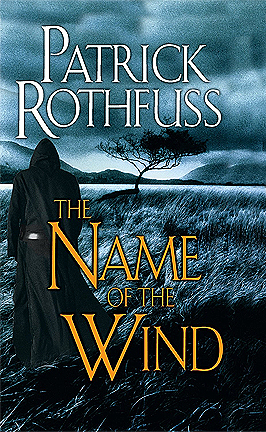 The Name of the Wind is great too, parts of it reminded me of an adult version of Harry Potter. Speaking of which, the Harry Potter Illustrated Series would be an awesome Christmas present to have. One can never have enough of Harry Potter.